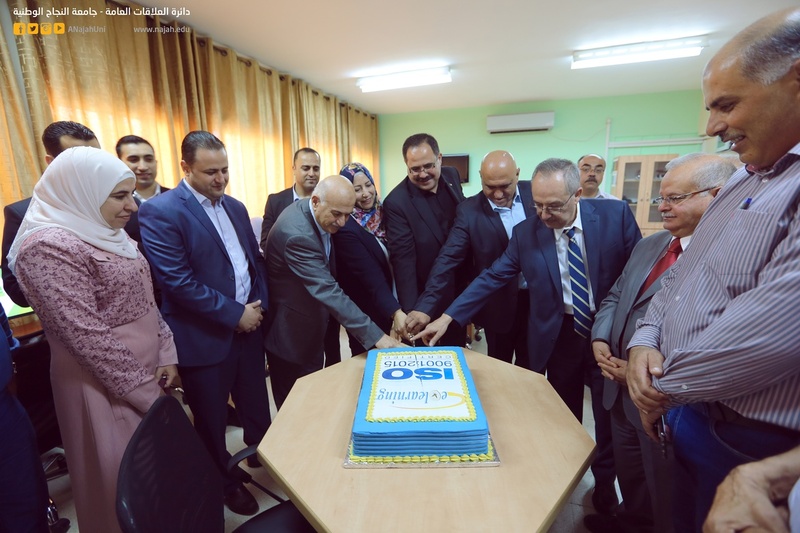 On Thursday, July 5, 2018, and under the patronage of the Minister of Education and Higher Education, Dr. Sabri Saidam, the E-Learning Centre at An-Najah National University celebrated obtaining the ISO 9001:2015 certification. 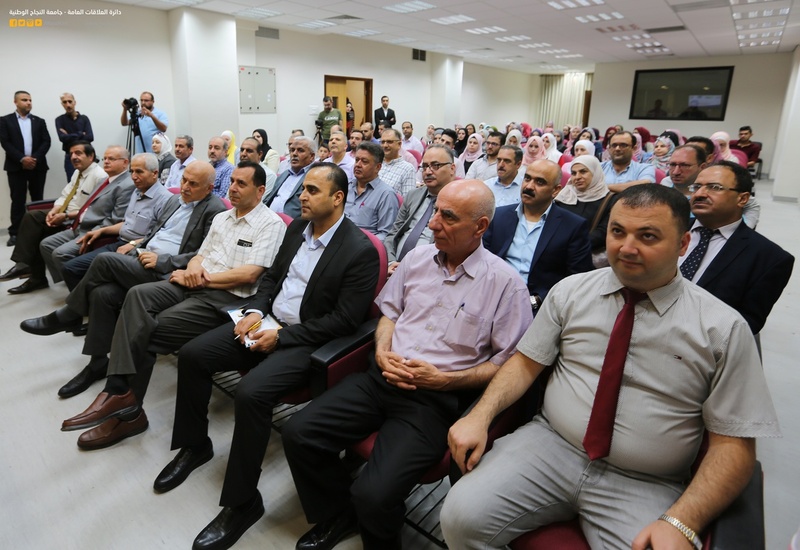 The ceremony was attended by Professor Maher, Natsheh, Acting President of An-Najah, General Manager Akram Rajoub, the Governor of Nablus, Engineer Adly Yaish, Mayor of Nablus Municipality, Mr. Jihad Ramadan, Dr. Sa'eda Affouneh, Director of the E-Learning Centre and Eng. Shereen Al-Sayed, Global Group Palestine Operations Manager as well as An-Najah's vice presents and assistants and faculty deans. 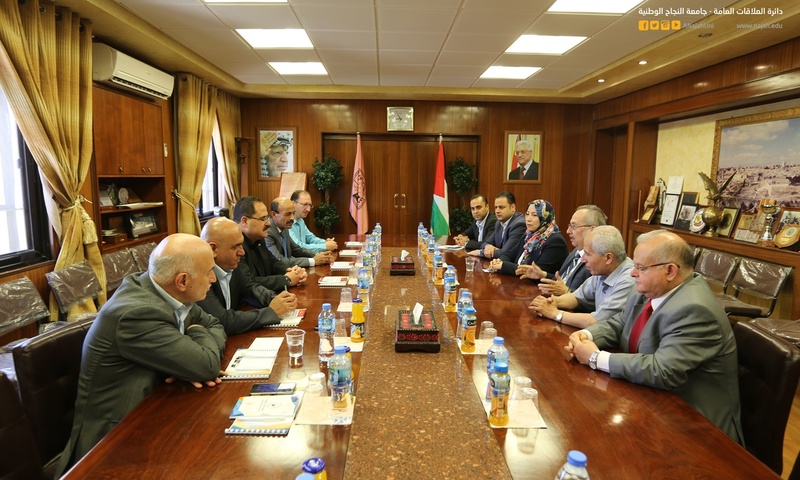 Dr. Saidam congratulated An-Najah for achieving this success and mentioned that the Ministry of Higher Education focuses on technical and apprenticeship learning. He commended the efforts made by An-Najah academic and administrative staff and their contribution to achieve this success. 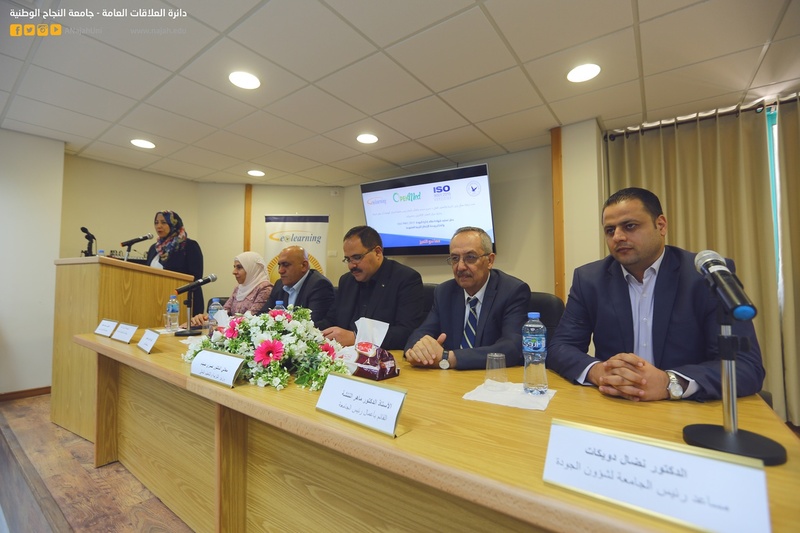 In the opening speech, Prof. Natsheh talked about An-Najah's recent achievements including obtaining ABET accreditation for 9 engineering programmes and obtaining ISO 9001:2015 Certification by An-Najah Child Institute. He said that the University aims to offer high quality education services; therefore, it initiated the Quality Assurance Unit. He added: "Although the E-Learning Centre is newly established, it was able to compete on the national and international levels. The Centre offers competency development training to the academic staff and e-courses for the University students. 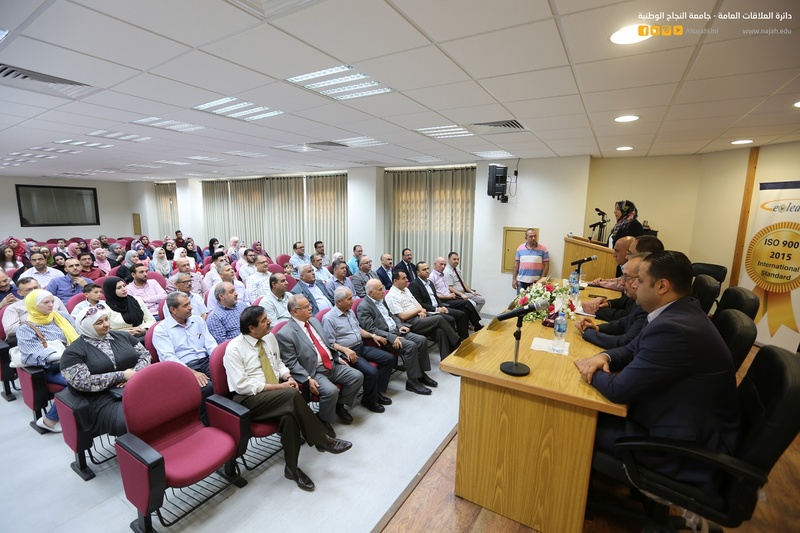 It also offers open courses such as the first Massive Open Online Course (MOOC) 'Discover Palestine' and the second MOOC 'Genetics and Society' as well as launching the Security and Safety Initiative." Proceeding from the university‘s strategy plan of 2011-2015, the E-Learning Centre was founded to contribute in the achievement of the first objective of that plan, which is to rise in higher education, develop it and re-enforce it in all domains. The Centre focuses on the importance of employing technology in the teaching-learning process and addresses the issue of the development of the academic process management through the implementation of technology as a means for reinforcing education. The Centre aims to arrive to a high-quality education in both learning and teaching, in order to achieve the best educational, training and social outcomes to be able to compete with higher education institutions. The Centre also seeks to design and develop high-quality, combined courses, to improve the outcomes of education, by developing teachers' and students' competency, providing support and funding projects for it and conducting supportive experimental, evaluation, processional and survey research. 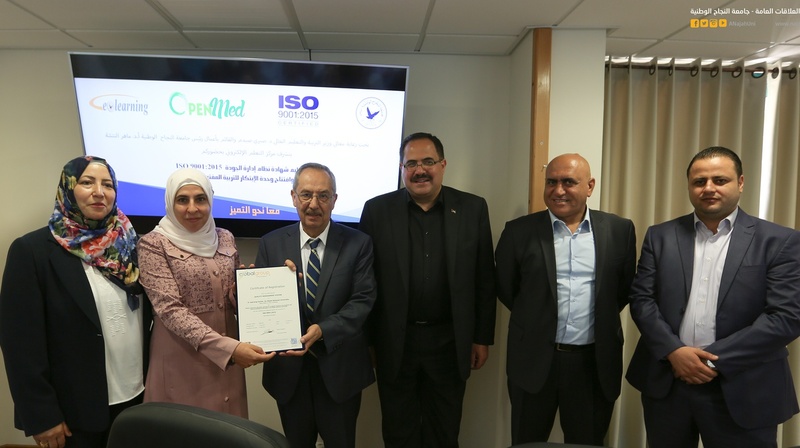 ISO 9001:2015 Quality Management System (QMS) is internationally recognized as the world’s leading quality management standard and has been implemented by over one million organizations in over 170 countries globally. ISO 9001 implemented, to its full potential, becomes an invaluable asset to the organization. 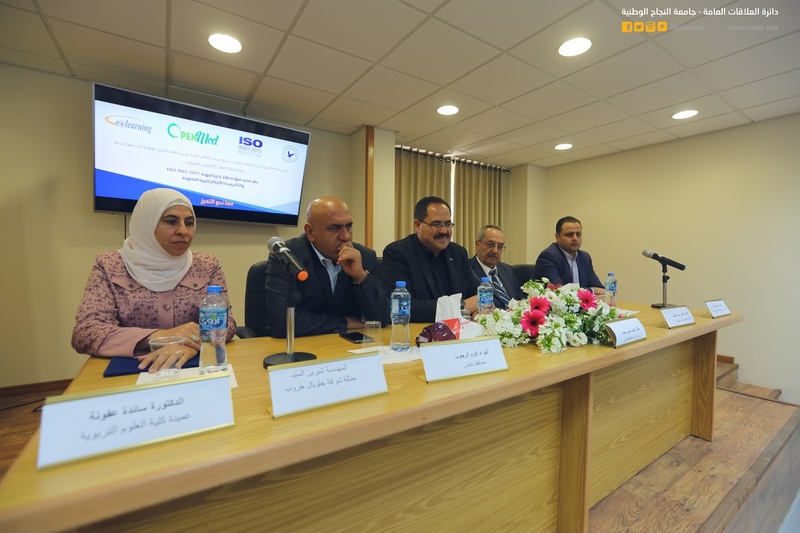 It is worth mentioning that An-Najah has also inaugurated the Innovation and Open Education Unit which offers smart learning spaces for the Faculty of Educational Science and Teacher Training students. The Unit is part of OpenMed, an international cooperation project co-funded by the Erasmus+ Capacity Building in Higher Education programme of the European Union during the period 15 October 2015 – 14 October 2018. It explores the adoption of strategies and channels that embrace the principles of openness and reusability within the context of South-Mediterranean universities.